Property 5: Apartment in Cadaques Caribe Resort. Property 9: Dog-friendly condo w/ shared pool, 5-minute walk to the beach! Property 13: Exotic apt. w/shared pool, near the beach and close to adventures! Property 24: Front of Caribbean Sea, beautiful apart. with pools & direct access to sea. 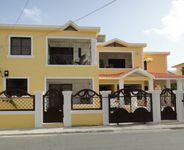 Property 36: Oasis in the Caribbean in Palmares de Caleta. All around great place and host! We were very pleased with the house. Ronny was extremely helpful, the house was clean and had everything you might need. Kathy, the housekeeper, was great. They both helped make our stay in La Romana great. I would recommend to anyone.